How to create a form to embed in your website or share directly. Here we’ll cover how to build and share a webform using the 99Inbound form builder. 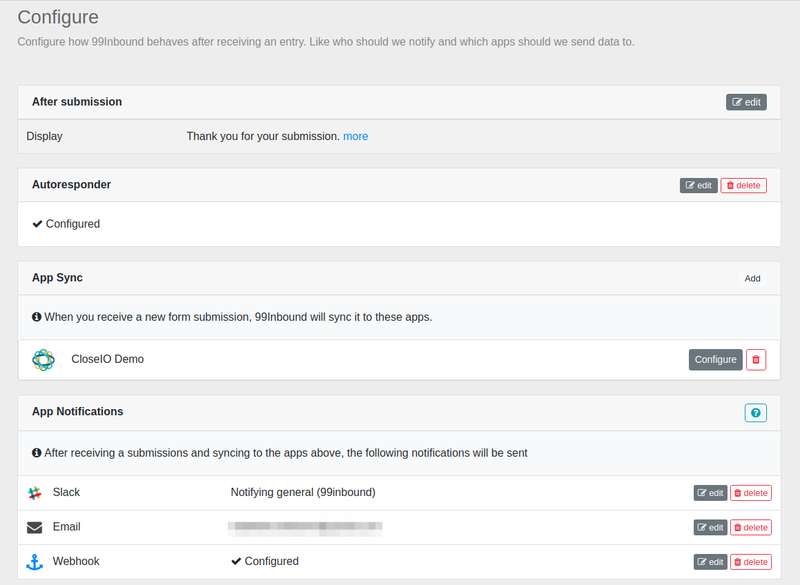 Once you’ve signed up for 99Inbound, click on ‘forms’, then ‘new form’ to create a new form. You’ll be presented with an interface that allows you to visually build your form – add new form fields, add text, change the theme, etc. To add a new field to your form, simply click the large + button at the bottom of the form. To edit an existing field - simply click on the field in the form preview, or drag the field to re-order it. Here is the form builder in action. Learn how to configure your forms to do amazing things. Now is the time to share a link to your form or to embed the form on your website. Regardless of how you publish your form, it will be fitted out with anti-spam technology, so you can be assured you won’t receive junk data from spam bots.